History professor Seth Bruggeman took his students on a tour of an early twentieth century dye factory in North Philadelphia to show them the evolution of the manufacturing industry over the last century. 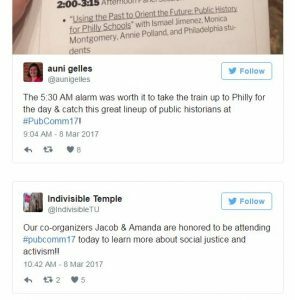 Temple public history students, Cynthia Heider and Chelsea Reed were key in organizing this year’s annual PucComm (Public History Communtity Forum) conference for Philadelphia’s public history communities and students, held at the American Philosophical Society on March 8. All the students from Temple’s MA class of ’18 served as key volunteers. Among them, Ted Maust put together this Storify – Check it out! My journey with the National Park Service began at Independence National Historic Park in May of 2015, two weeks after finishing my Masters in Public History at Temple University. Since then I have worked seasonal positions at Joshua Tree National Park, Saugus Iron Works National Historic Site (co-managed with Salem Maritime National Historic Site), and did a short stint at Death Valley National Park. These NPS units protect a diverse array of natural and cultural resources. They are as varied in their physical size and visitation as they are in the resources they protect. My positions have been in the Interpretation and Education division as a uniformed Park Guide and Park Ranger (essentially the same position). My primary duties involve interacting with the public and have included leading tours and educational programs, operating visitor centers, and roving. I have been fortunate to pick up extra duties such as being a web author for Saugus Iron Works and helping develop a media database for Joshua Tree. When I first arrived at Independence NHP the amount of information to learn and scale of the crowds were overwhelming. Some of my previous experience in public libraries helped in communicating with the public. My public history courses were valuable in helping me think about how the visitors connect to the history in different ways. Dealing with the crowds and public speaking in front of large groups were my biggest challenges, and only after repeated exposure to the crowds did I become comfortable in them. After five months I traded interpreting the Liberty Bell, Constitution, and Declaration of Independence for interpreting mining, ranching, and homesteading in the California desert. In moving from a historic-centric park to a nature-centric park, I have had to remind myself how my training in history determines how I analyze information. The questions that I find important and my logical process can be different than someone trained in the sciences. Learning about the geology and animals and plants of the desert was a little like learning Martian at first. However, some experiences are transferable from seemingly disparate parks. My experience with crowds at Independence NHP was helpful in coping with Joshua Tree’s record-breaking visitation. The next job took me back east again, this time interpreting the industrial history of early colonial Massachusetts. The Saugus Iron Works is smaller and revolves more around the local community than larger parks. Many visitors are descendants of the iron workers and some remember the reconstruction of the iron works as an important town event. The more personal relationship that people had with the park in addition to the generally smaller tour sizes made my programs at Saugus feel more intimate than they had before. Now that I am back at Joshua Tree, I have found myself cross-referencing the histories of the different parks: discussing how industrialization and land use in both seventeenth century New England and twentieth century California have affected the ways that those places developed to the present. Moving from park to park is a never-ending learning process and those moments where I can connect with visitors from different places and backgrounds is the most rewarding thing I do. There are multiple routes toward working with the NPS. Federal positions, posted on USAjobs, are one way to go. The online applications are very specific and federal resumes need to be more detailed than average. For students interested in applying I would recommend getting exposure to the parks as early as possible, even through volunteering a few hours a week. For those interested in interpretation, completing the online Eppley courses in interpretation can help; some job postings will specifically ask in the questionnaires if you have taken these courses. For students, you can consider the Pathways program, but even this is very competitive. 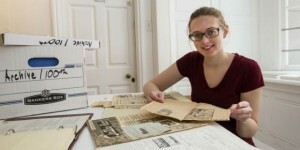 Many people start out with the Student Conservation Association (they have positions at historic sites! ), AmeriCorps, or other organizations that partner with the parks. For example, there are people who work for the Great Basin Institute at Joshua Tree and for Essex Heritage at Saugus Iron Works. Never get disheartened! Since beginning to work with the National Park Service I have grown to understand it a very small organization. I have yet to move to a park where someone did not know someone else I have worked with at a different location. The resulting organizational culture is close-knit, and can seem insular at times. There are cons to this, but one pro is that most NPS employees are extremely dedicated to one another and to their jobs. Working in different locations and thinking about the different histories that each park represents has added an additional perspective to my own preconceptions of the history of the United States and the role of the NPS. Being a seasonal Park Ranger is an uncertain life. I do not know where I will be in six months, but I am looking forward to what I will learn along the way. 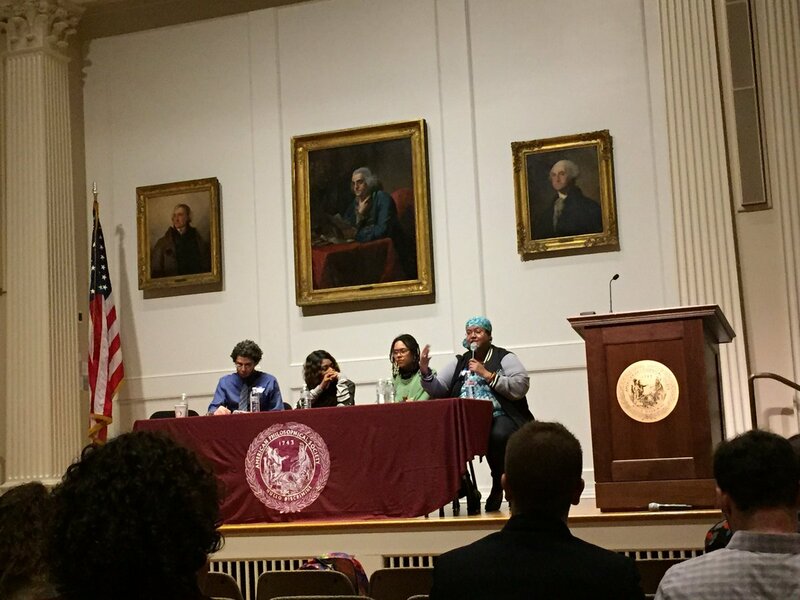 Guest post by Olivia Wright, a student in History 2150: Introduction to Public History. Having lived my entire life a handful of SEPTA Regional Rail stops outside of Philadelphia, it is easy to take for granted the nearby wealth of history that tourists traverse hundreds or thousands of miles to experience. Of course, being a history major as well as someone with an unhealthy obsession with Hamilton, it is impossible to not appreciate and love the landmarks which are the pride of the city I claim as my own. This week, I was able to view the Independence Mall area in a way I had not before, despite the numerous times I’ve been exposed to it. I saw the several blocks, as my professor aptly described, as a “museum for museums.” With over a half dozen different institutions and monuments, it’s easy enough to think that these buildings cropped up simply where space could be found. 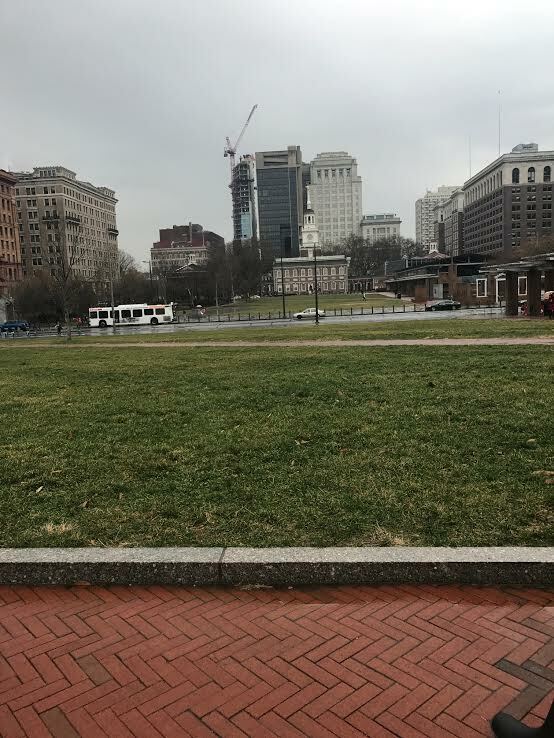 As I learned, however, Independence Mall itself was deliberately made as a green space, removing surrounding structures in an effort to immortalize the feeling of Independence Hall supposedly as the Founders, well…found it. This colonial bubble wrap of sorts is very effective up close, but as the image below suggests, a much more dissonant image is created. 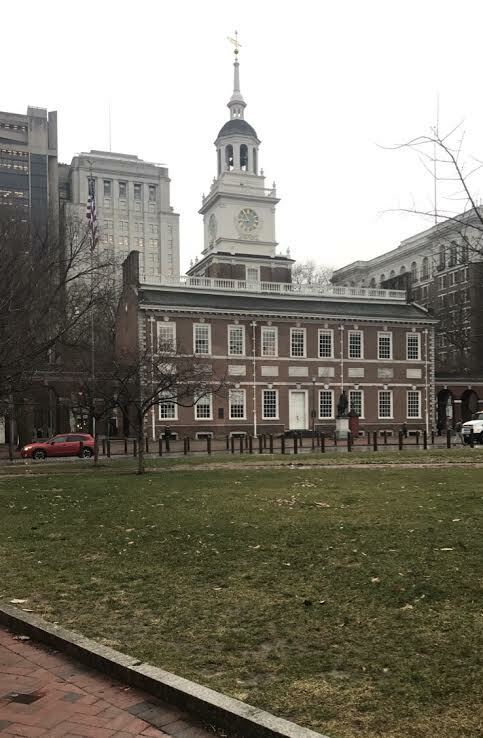 Of course, nobody can expect Philadelphia to preserve every bit of skyline behind Independence Hall to perpetuate a “pure” image of history. In fact, I argue that this juxtaposition is even more striking than the experience of standing across the cobbled street in front of the building. Seeing the modernity of the city, watching a motorized vehicle (gasp!) ride past a 240 year old image of history, evokes just that: It is history. The fact that it is in the past, that there are now taller buildings and indoor plumbing, does not negate it’s importance. Experiential learning is a great way of engaging people in history education, but it’s hard to pretend like you’re about to enter a session of the Continental Congress when you have a helicopter hovering overhead. Being in a city built around that history, you cannot avoid the 21st century intrusions. And that is okay. I like this quote. 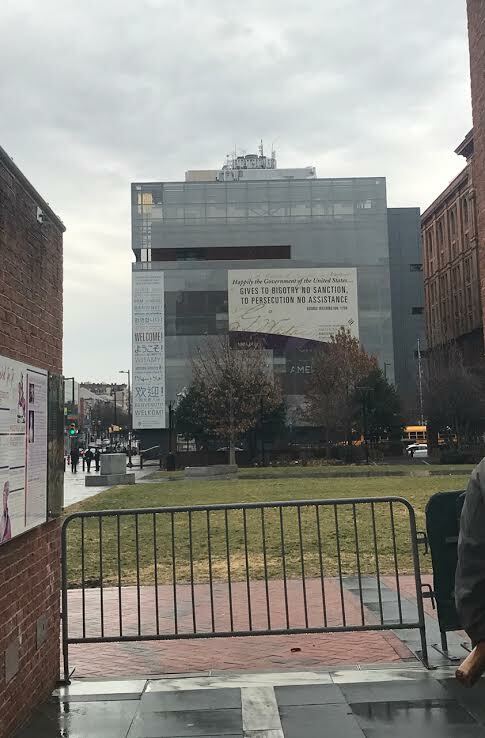 It’s a highly appropriate statement to have on a museum detailing the history of a people who had to flee a foreign government which instigated those very things Washington speaks against. When viewed while standing inside the President’s House exhibit, an outdoor memorial to Washington’s former residence, you get to read the words of a man speaking about freedom while on the same ground his own slaves once served him. These things are very dissonant. Freedom and slavery obviously are not compatible. I make no excuses for Washington on the slavery front, but moral absolutes are dangerous, and that aside, I have enough public school indoctrination (and enough Ron Chernow books) in me to say that he was still a great man who made highly valuable contributions to his country. Whether it’s moral dissonance or visual dissonance, acknowledging these complexities and working through them for yourself is an important step in understanding history and all of the baggage it comes with. Independence Mall, in the heart of a vibrant, always-growing urban region, has its own weight to carry in this regard, but the confrontation of ideas it presents is what makes it such a valuable institution in the first place. Stephanie Williams – Public Historian engaged in Art! Stevi completed this project while she served as an intern at the Philadelphia International Airport’s Art at the Airport program. Professor Seth Bruggeman’s Studies in American Material Culture course this spring took students out of the classroom and into The Clay Studio. 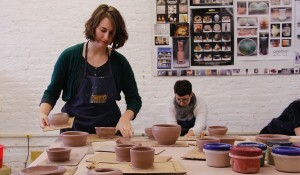 Students learned to throw pots from the studio’s Daniel Ricardo Teran. Check out a full article on the class here. 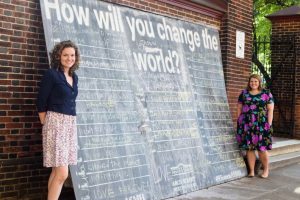 Temple History grad Erin Bernard has won the 2016 National Council for Public History’s award for Best Public History Project for The Philadelphia Public History Truck. 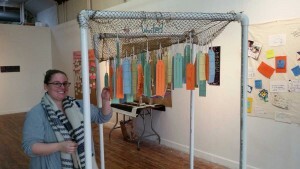 See also the College of Liberal Arts recent article on Erin’s acheivements and current work in Chinatown. Way to go Erin! 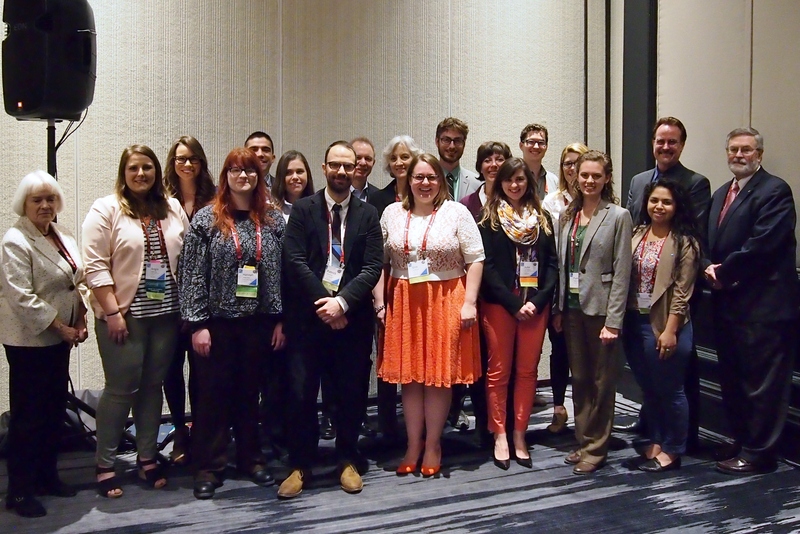 Erin Bernard at center with all award winners at the annual NCPH conference in Baltimore, MD. Public History MA student Sarah Sutton shares her perspective on a new part-time position with Center partner, the Philadelphia Society for the Preservation of Landmarks. In February 2016, I joined the team at the Philadelphia Society for the Preservation of Landmarks as Outreach Coordinator. 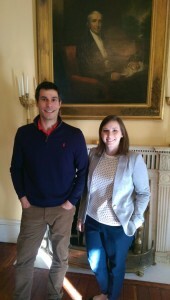 PhilaLandmarks is a non-profit organization which cares for four historic houses in the Philadelphia area. I first learned about PhilaLandmarks through Managing History, the introductory course for new graduate students focused in public history at Temple, taught by Dr. Hilary Lowe. During this course, my classmates and I each created a self-guided tour for the Powel House; one of PhilaLandmark’s pre-Revolutionary historic houses in Society Hill. This position is designed to help PhilaLandmarks grow their membership, attract younger audiences, create events that would foster relationships with younger audiences at their house museums, and generate strategic partnerships with other museums and non-profits around the city. In this role, I attend Young Friends meetings and events in Philadelphia and make connections with young professionals in the culture industry, as well as other fields. Since this work started, I have had a crash course in the non-profit community in Philadelphia and discovered a great deal about PhilaLandmarks’ position in that community. 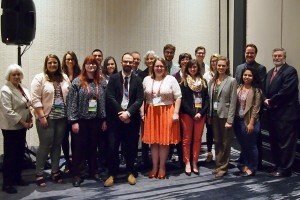 I can see real-world connections between my position and my current classes, particularly Non-Profit Management for Historians thanks to my professor, Ken Finkel. I’ve been able to bring what I’m learning about strategic planning and management directly to my work at PhilaLandmarks. 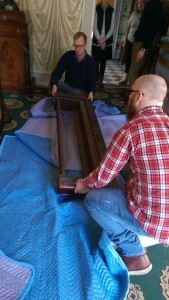 For instance, sitting in on a Collections Committee meeting at the Physick House, I’ve been able to see firsthand how accessioning and de-accessioning of the collections plays out in small museums, and I’ve been able help unpack and place a new historic piece of furniture. These experiences improve my ability to navigate the non-profit world and my understanding how to effectively present ideas to board members and committee chairs. Having the opportunity to work closely with professionals in the field like Executive Director Jonathan Burton, Development Coordinator Mickey Herr, and other members of the PhilaLandmarks team has been amazing! We have some great ideas in the works for the upcoming months, and I am eager to get to work and continue learning. Recent Temple Public History Alumni Dana Dorman (’09) and Erin Bernard (’15) have big projects in the works in the greater Philadelphia area. 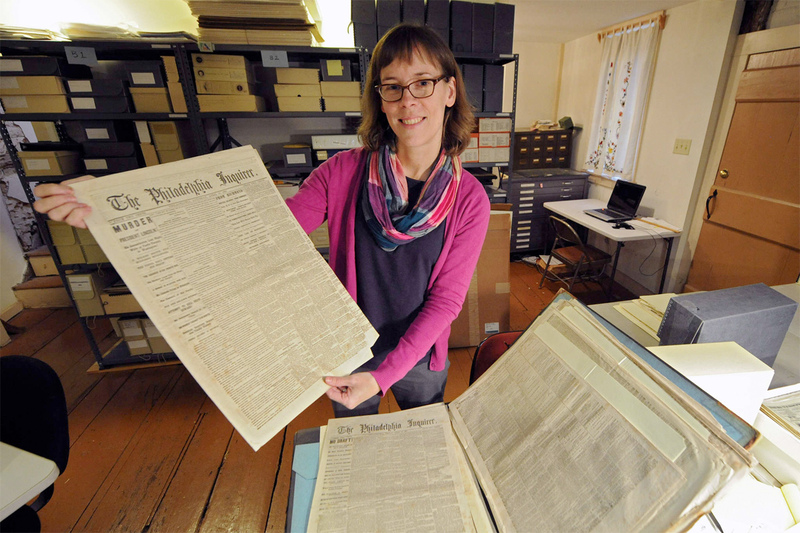 Read about Dorman’s current work as Archivist and Librarian at the Historical Society of Haddonfield to enhance the society’s new Archives Center in the Philadelphia Inquirer. Erin Bernard’s new History Truck project is also making the news, as it collects new oral histories, art, and material culture in Philadelphia’s Chinatown. Check out NewWorks’profile of her recent work.